The cost to repair a damaged concrete slab depends on several factors, including the repair technique that’s used. Foam injection techniques allow for fast, nearly invisible repairs, with little disruption or mess. A sunken or settled concrete slab should usually be repaired as soon as possible. In addition to posing a safety hazard, a concrete surface that’s uneven or damaged due to cracking will surely detract from a property’s appearance and real estate value. Who do I call for slab repairs? Although general contractors and handyman services often offer slab repairs, it’s better to go with a concrete repair specialist with experience in slab raising or slab jacking. Better yet, look for a concrete repair specialist who advertises the PolyLevel® System, an advanced and very effective technique for permanently raising and leveling settled slabs. How much will slab repair cost? It’s nearly impossible to estimate the final cost of a slab repair, mainly because each situation is unique. A smaller slab-raising repair (like a single section of sidewalk, for example) will usually be less expensive than a repair that covers a larger area or involves multiple slab sections. Repairs that require patching or filling cracks and replacing missing sections of concrete are other factors that can add cost. How long will it take before the concrete surface is usable again? Some slab repair techniques take longer than others, and require additional time before the repaired concrete surface can be used again. For example, slab replacement, grout leveling and grout pumping (mud jacking) are three techniques that require fresh concrete or mortar to be used. Once the fresh concrete or leveling grout is placed, it can take days for the repaired area to harden and cure properly so that the slab can be put back into use. In contrast, the PolyLevel® repair process can be completed in less than a day. A PolyLevel® slab repair enables you to use the restored concrete right away. Down time is minimized. Why pay a lot of money for slab crack repair if you know the slab may sink or settle again in the future? Pouring more heavy concrete over soil that is susceptible to compression or settling might increase the chance of settling in the future. In contrast, PolyLevel® is lightweight and extremely stable. It imposes very little weight on the soil, so it won’t cause further slab sinking or settlement. 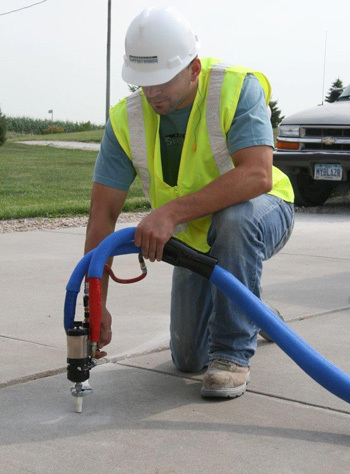 PolyLevel® is an innovative slab-raising, void-filling technology that offers significant advantages over older techniques such as mud jacking, concrete replacement, grout pumping and grout leveling. The PolyLevel® process utilizes expanding, high-density polyurethane foam to raise settled concrete. Because the foam expands and cures within a matter of minutes, the re-leveled concrete can be returned to full use almost immediately. PolyLevel® offers the additional benefits of strengthening and consolidating loose soil to help prevent future slab sinking. Interested in this fast, cost-effective method of fixing settling concrete slabs? Contact us today for a Free Estimate from a PolyLevel® dealer near you!